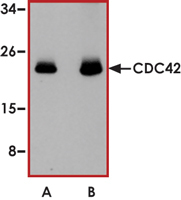 Sample Data :Western blot analysis of CDC42 in human brain tissue lysate with CDC42 antibody at (A) 0.5 and (B) 1 ug/ml. Scientific Background :CDC42 is a member of the Rho family of GTPases and is part of cellular pathways fundamental to growth, differentiation and apoptosis (1). Downstream targets for CDC42 include those that regulate the actin cytoskeleton (e.g. WASP) and cellular stress pathways (e.g. PAK) as well as the coatomer protein complex and PAR6. CDC42 is involved in the G(1)-S progression of the cell cycle. CDC42 and its downstream effector mDia3 are involved in bi-orientation and stabilization of spindle microtubules attachment to kinetochores and regulate chromosome alignment and segregation during mitosis (2). 1. Sato, S. et: Tau-tubulin kinase 1 (TTBK1), a neuron-specific tau kinase candidate, is involved in tau phosphorylation and aggregation. J. Neurochem. 98: 1573-1584, 2006. 2. Houlden, H. et.al: Mutations in TTBK2, encoding a kinase implicated in tau phosphorylation, segregate with spinocerebellar ataxia type 11. Nature Genet. 39: 1434-1436, 2007.